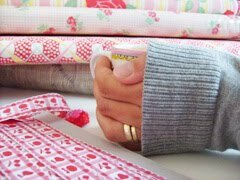 Blij als mij: More to sew..
are for infants only. Have to adjust the pattern first though. upcoming fair. Love to make them! This wonderfull package I've got from the lovely Michele. 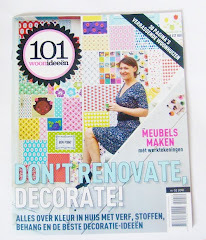 by Anna Maria Horner and lots of quilts...Very inspiring! 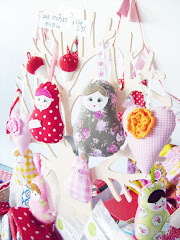 The lovely bird is hanging in my eastern tree...looks lovely!! Thank you so much Michele for sending me this treat!! Your bibs look great - the snaps give it a professional finish! They are beautiful and will fly off the shelves! I wish I could be there to scoop a couple up! Big bibs are a good idea for messy big kids like mine! We have Echidnas in Australia. The hedgehogs are so cute! I'm sure all the kids at the market will want one. You are so smart with the fabrics, too. Just perfect. Erna, those hedgehogs are truly adorable! I love them. They would be perfect for the nature table--I'm sure they'll be hot sellers at your craft fair event. Also, the bibs are so cute. I made similar bibs last summer for my youngest and I still love putting them on him. Thank you so much for the kind comments you left on my blog. I'm glad you enjoyed your visit--stop over any time. Those hedgehogs are so cute, my heart is aching! Any chance they'll make it to your shop? I have a few hedgies here who would like a new brother!